A hurricane warning mirrors the emotions about to erupt inside an off-season summer Key Largo hotel. An unusual quintet of "sport fisherman" have taken up residence at the Largo Hotel. A bus pulls up to the hotel and a stranger walks into the hotel. It's a classic set-up. The fisherman are a gang of hoods led by Johnny Rocco, a gangland kingpin on the run. They've arrived to rendezvous for a money pick-up and then high-tail it to the safety of Cuba. The stranger is Frank McCloud. He's there to pay his respects to the hotel owner, old man James Temple, and to Nora Temple, the widow of Frank's army buddy. McCloud reluctantly gets swept up in the frothing tension . Sexual sparks ricochet around the tight quarters of the hotel room like an out-of-control gunfight. Though the claustrophobic hotel setting could easily seem stage-bound, the characters move with unusual energy in every scene. Rocco, a pacing tiger waiting for his food, takes possession of the hotel with sadistic ferocity. McCloud bides his time with gritted teeth. Nora challenges Rocco with fire in her eyes. The winds blow tauntingly. More than anything, the thespian fireworks light up this claustrophobic drama. One performance seems better than the next. Humphrey Bogart walks into the hotel and all eyes immediately gravitate to him. 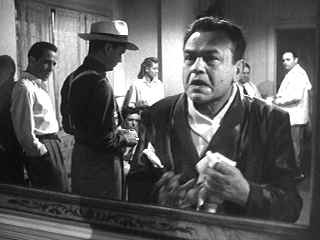 Edward G. Robinson arrives and you can't take your eyes off him except that Bogart's in the room. Claire Trevor tremors through an incredible performance as the abused Rocco girlfriend Gaye Dawn , a once beautiful singer gone sour on the booze. Bacall is tough right in Rocco's face. Lionel Barrymore is an old stick of dynamite with a short fuse but lacking nitro. Presiding over the tightly scripted dramatics is director John Huston. Huston never lets up on the tension. All the rhythms are perfectly tuned. Warner has found gorgeous elements for the DVD transfer of Key Largo. Sharp from the opening moments to the last seconds and blessedly free of dirt and scratches, Key Largo looks like it could have been released to theaters last year. The contrast range is excellent and shadow detail captures the lighting well. Blacks have proper luster. The mono sound is free of hiss and dialogue articulated withy great clarity.